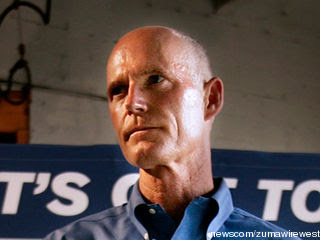 SPaul note: Governor Scott ran for the office of Florida's Governor under the Tea Party umbrella. Time would tell though, that this umbrella was one of deception which guaranteed a win over real visionaries who wanted to change Florida for the betterment of the people not just Corporations. The Tea Party (Taxed Enough Already) only served to get this man elected but as soon as he was in office, he began to implement the same Republican, Corporate controlled intiatives like Walker in Wisconsin and Christie in New Jersey. Scott has raised Property Taxes and decreased education, a calling sign of the Tea Party supported lies across this Nation. To date, the Tea Party has only served to fool We the People and those who ran for office under it's slogans and promises of change, won control over States to further the Corporatist Agenda. The old adage of "Fools and their money will soon be parted" can be paraphrased in this case to "A fool and his Freedom, will soon be parted" if America doesn't wake up to this political deception. Since taking the reins as Florida’s 45th governor in January, Scott has regularly had kind words to say about the “Lone Star State,” which has led the country in job creation during the past decade. In a February speech at a Naples luncheon sponsored by the libertarian Cato Institute, Scott also touted Texas. He said he told Texas Gov. Rick Perry that whatever Texas does to attract business, Florida will do better. “We are actually competing,” Scott said. Texas has developed a business-friendly reputation in recent years for its mix of relatively low taxes, light regulations and pro-business tort reform. “It’s just a great place to do business,” said Deane Foote, an Arizona-based site selection consultant who helps businesses find homes. It also has benefited from its geography and geology – lots of land and lots of oil – advantages that most other states can’t replicate. Texas’ critics point to the state’s relatively high rate of poverty, low investment in education, and high percentage or residents without health insurance as reasons to avoid the Texas model. Also, the rock-hard belief that Texas had largely avoided most of the negative effects of the recent recession has started to crumble – the state is facing a $27 billion deficit over the next two years. That’s the low end of the number of jobs Texas has created over the last decade, more than the 49 other states combined, according to U.S. Bureau of Labor statistics and Politifact Texas. That success lies, in part, on low and stable taxes, a business-friendly permitting process and pro-business tort reform, said Talmedge Heflin, director of the Texas Public Policy Foundation, who served on Scott’s economic transition team. “If anything can be learned from what Texas has been doing, it’s stability,” said Heflin, whose foundation is committed to free markets, limited government and individual liberty. Like Florida, Texas doesn’t have an income tax. Unlike Florida, which has a 5.5 percent corporate tax – a tax Scott is trying to weed out – Texas has a 1 percent “margin tax” on business profits. Margin taxes can be economically distortive, and are sometimes seen as less business-friendly than a corporate tax, said Kail Padgitt, an economist with the Tax Foundation in Washington, D.C.
As a result, the Tax Foundation has rated Florida ahead of Texas in terms of its business tax climate – Florida 5th, Texas 13th. In 2003, Texas made several business-friendly tort reform changes, including capping non-economic damages in medical malpractice lawsuits, and requiring juries to consider the fault of everyone who contributed to an accident in product liability cases. “Texas is no longer the lottery state for court cases,” Heflin said. Similar reforms are under way in Florida. Texas’ environment isn’t as fragile as, say, the Everglades, Heflin said, and its environmental regulations aren’t as strict. It is also known for having a relatively fast permitting process. Texas metro areas dominated the rankings of the best-performing cities of 2010 list, compiled by the Milken Institute, a California-based economic think tank that ranks cities by job creation and economic growth. Of the top 25 metro areas on the list, 11 were in Texas, including the top performer, Killeen-Temple-Fort Hood. No Florida metro areas made the top 25, although Florida dominated the list as recently as 2004, when Fort Myers-Cape Coral was ranked No. 1. Texas has benefited recently from having lots of available land for businesses and stable housing prices for workers. “(Texas) actively recruits,” said Kevin Klowden, an economist with Milkin. “It goes after businesses and makes a point of not only touting its lower cost structure, but will make a point of trying to match businesses with local partners, and eventually with potential sources of local labor. While free-marketeers tout Texas’ business-friendly climate, McCowan sees his state’s darker side. “You peel back one layer of the onion and you see this is not what you want,” he said. While Texas’ 8.3 percent unemployment rate in January was below the national average, that was only good enough to place it in the middle of the pack of states. At the same time, a relatively high percentage of Texans – 17.2 percent in 2009 – live in poverty, according to the U.S. Census Bureau. Only seven states and Washington, D.C., had higher rates. In comparison, 14.9 percent of Floridians lived in poverty in 2009. Critics say many of the jobs created in Texas have been of the low-wage variety – retail, restaurant and hotel. “We have a great divide in economic status in this state between the haves and the have-nots,” said Ed Sills, spokesman for the Texas AFL-CIO. Critics also say that Texas isn’t investing in its future. Texas ranked 43rd in the country in 2009 in terms of expenditures for public schools per student, while Florida was 36th, according to the National Education Association. Texas was 43rd in the nation in terms of graduation rate in 2009, with 61.3 percent of students who were enrolled in the ninth grade graduating, according to the Legislative Budget Board’s 2010 Texas Fact Book. Florida had a 76.3 percent graduation rate in 2009 and a 79 percent graduation rate in 2010. Texas leads the country with the percentage of its residents who were without health insurance in 2009, according to the Center for American Progress. Twenty-five percent of Floridians were uninsured in 2009, according to the Center for American Progress, below only Texas (28 percent) and New Mexico (26 percent). Texas is competitive because it allows its natural resources, environment and people to be exploited, McCowan said. “We’ve been pursuing the same public policies for decades,” McCowan said. “What is the cumulative effect of these public policies? It is low household income, high poverty, high numbers of people without health insurance, low educational attainment. Mark Wilson, president of the Florida Chamber of Commerce, doesn’t necessarily buy the idea that Florida should model itself after Texas. Florida, he said, was growing by leaps and bounds until the recession hit in 2006. Since then, Wilson said, Florida has made great strides to improve its education, legal and tax climates. While Texas has done a good job selling its pro-business brand, Wilson said, Florida actually is pro-business, and is becoming more so.